Leo Strauss ">[ʃtraʊs]; September 20, 1899 – October 18, 1973) was a German-American political philosopher and classicist who specialized in classical political philosophy. He was born in Germany to Jewish parents and later emigrated from Germany to the United States. He spent most of his career as a professor of political science at the University of Chicago, where he taught several generations of students and published fifteen books. Politics and philosophy as necessarily intertwined, the unresolvable tension between Reason and Revelation, esoteric and exoteric writing. 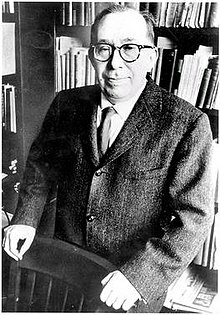 Leo Strauss (/straʊs/; [ʃtraʊs]; September 20, 1899 – October 18, 1973) was a German-American political philosopher and classicist who specialized in classical political philosophy. He was born in Germany to Jewish parents and later emigrated from Germany to the United States. He spent most of his career as a professor of political science at the University of Chicago, where he taught several generations of students and published fifteen books. Originally trained in the neo-Kantian tradition with Ernst Cassirer and immersed in the work of the phenomenologists Edmund Husserl and Martin Heidegger, Strauss later focused his research on the Greek texts of Plato and Aristotle, retracing their interpretation through medieval Islamic and Jewish philosophy and encouraging the application of those ideas to contemporary political theory.